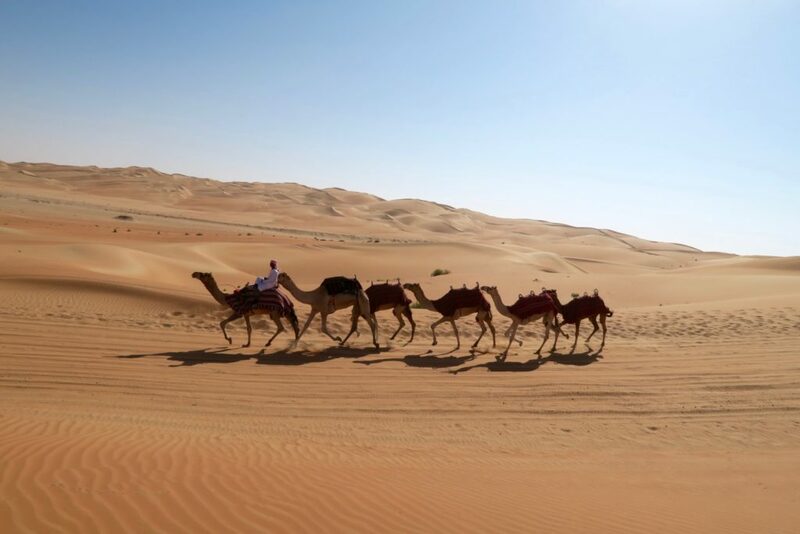 Located over 200 kilometres from Abu Dhabi, the Empty Quarter (Rub’al-Khali in Arabic) is the largest uninterrupted body of sand in the world. 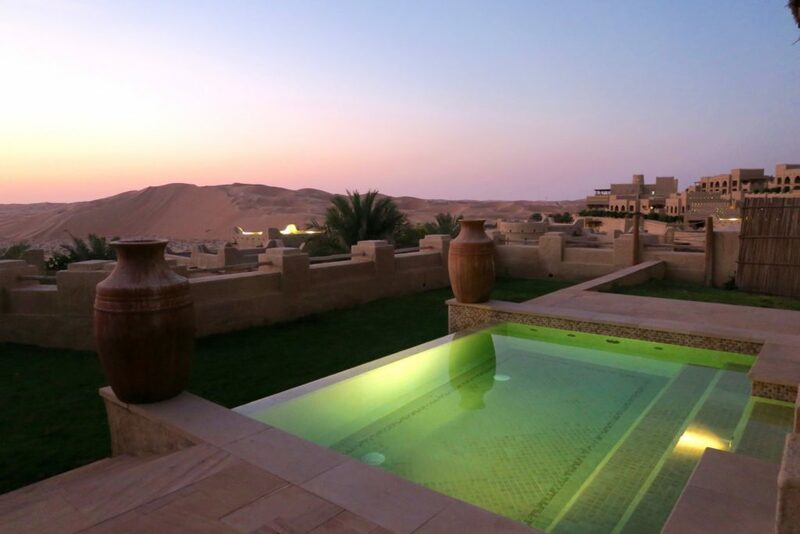 It is in this expansive desert where Qasr Al Sarab, Desert Resort by Anantara lies, a place where resort description superlatives like, “offering unparalleled luxury” and “stunning landscapes” not just come to life but are exceeded significantly. 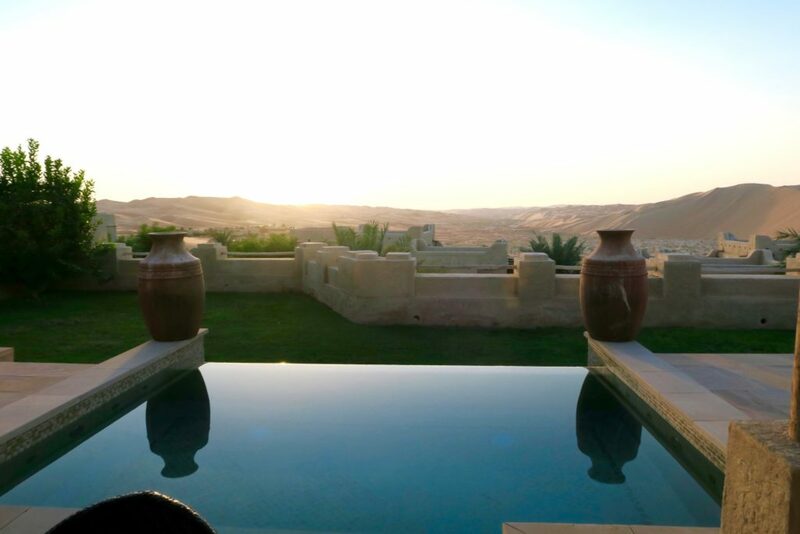 The name Qasr Al Sarab means “palace of mirage”. And after our long car ride in the seemingly endless stretch that is the Liwa Desert highway, it was indeed a mirage that seemed to appear in the middle of the golden sands. Construction of Qasr Al Sarab took 3 years, 5,000 workers and reportedly $245 Million. Imagine building an kingdom-like fortress in this vast desert. I normally place my videos at the end or middle of my reviews, but for Qasr Al Sarab, I would like to show you the video first. So you’ll understand why someone who is passionate about resorts was in complete awe of this property. Qasr Al Sarab is my first desert kind of resort and my experience definitely changed my previous belief that a great resort needs “the sun and water (ocean)” as its basic elements. Well, sun, sand, and a great focus on authentic experiences and service are the leading pillars that set my experience at Qasr Al Sarab. We visited in November, so while the weather was hot (high 20’s , early 30’s Celcius), it wasn’t as hot or stifling as expected. Nevertheless, our welcome drink provided much refreshment from being in the car for over 2 hours. It was a lovely yoghurt based drink that had the consistency of a milkshake. 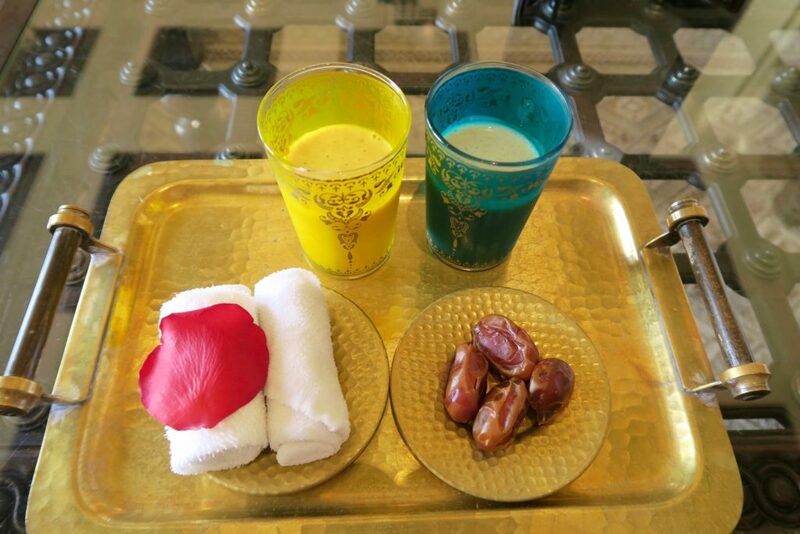 It went very well with the dates. Check in was done while we were seated at the lobby, and soon after, we were introduced to Johannes, who was to be our private butler for our stay. 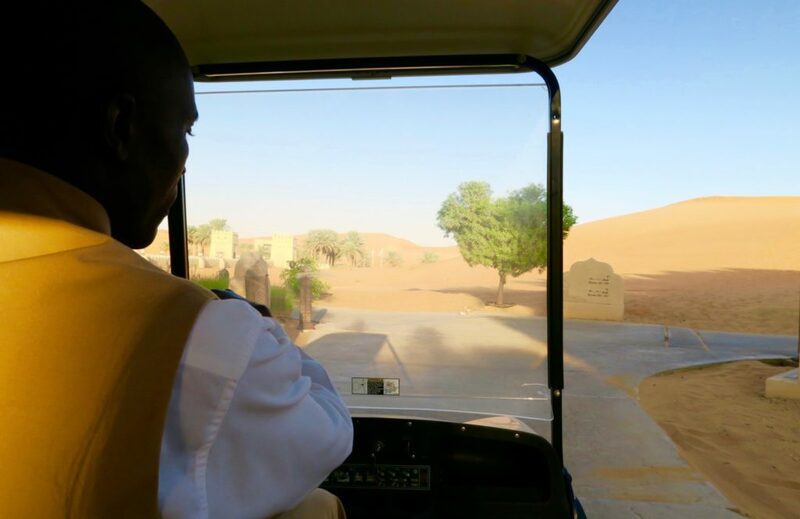 With 205 rooms, villas and suites, Qasr Al Sarab is sprawling and if you are staying in a villa, you will most likely require a buggy transport to get around. We booked a one-bedroom villa with private pool. Entering the villa really did feel like entering your own home. It was quiet (we never heard or have seen neighbours on either side) and extremely private. 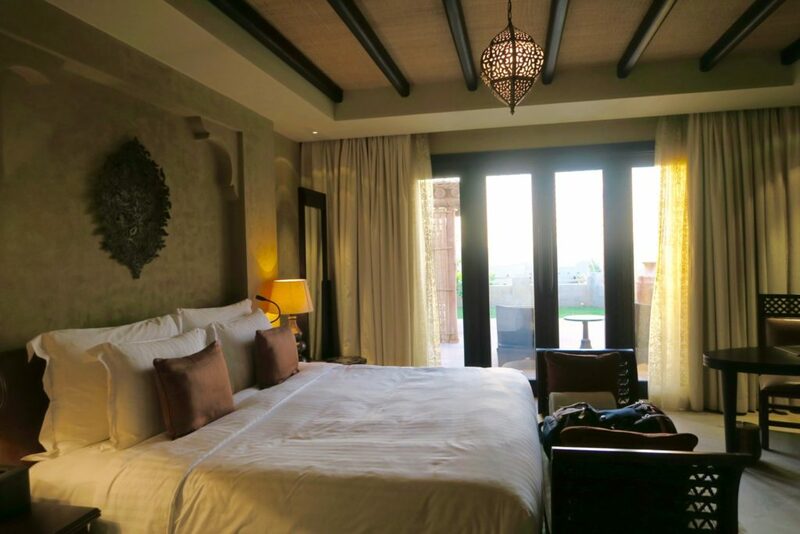 The living area is what first greets you when you open the double doors of the villa. The bedroom is in a separate area. I love the interiors of the villa. Every little furniture and element was placed and designed with the backdrop in mind. 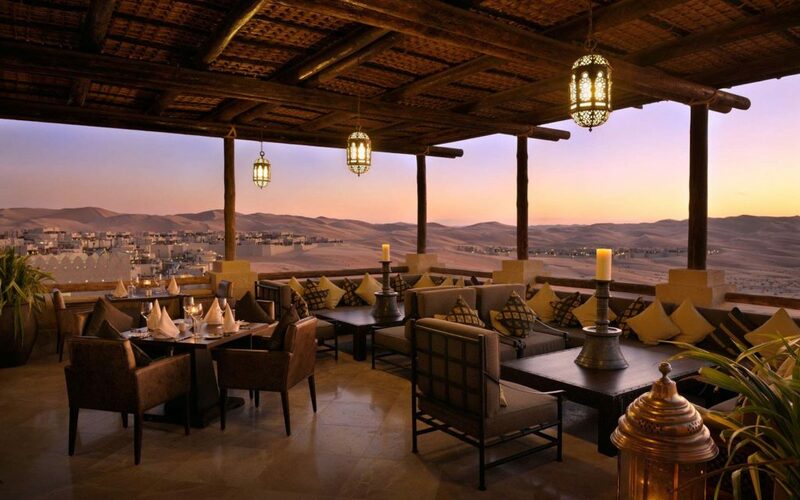 Anantara says you can experience living like a Bedouin when staying at the Qasr al Sarab. That is quite the understatement. A royal-blooded Bedouin is more like it! And that’s not totally a far-fetched idea, because Liwa Desert is the birthplace of the ancestors of the Royal Emirati family. The bed is a comfortable, proper king size, which had ample space even if both Zombie and I were sprawled side by side. 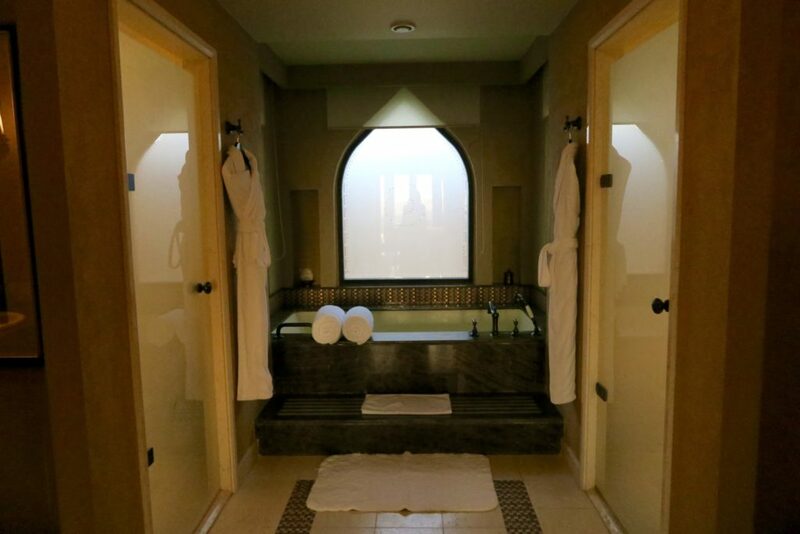 Double doors lead to the spacious bathroom. 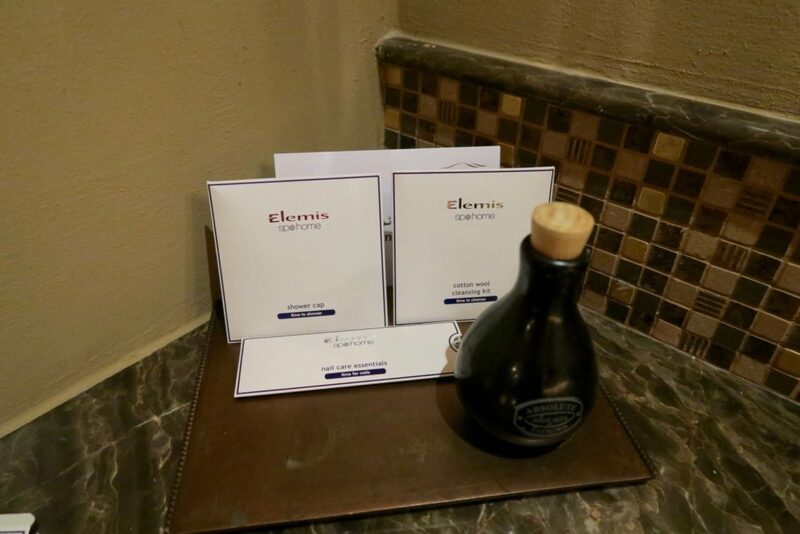 Double sinks facing each other, with a blend of Elemis and Anantara toiletries. I absolutely adore Anantara toiletries , especially their soap bars as they infuse a lot of spice in it! 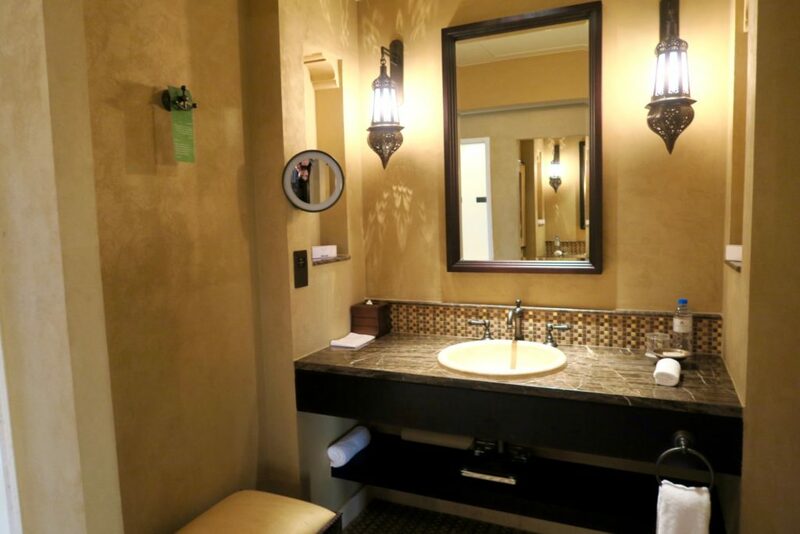 While there is no full-length mirror in the bathroom, there’s a strategically placed full-length mirror by the side of the bed, next to the sliding doors, which is actually strategic because it gets natural lighting (great for makeup!) Whereas the lights in the bathroom tend to be very yellow. Even though it’s in the desert, the water temperature of the pool is still controlled so that it’s not too cold that you’d get a shock from the temperature difference. Endless dunes. As far as your eyes can see. There really is something quite liberating knowing that you are not in a “gated” resort, and that you really are quite literally, smack in the middle of the desert. The sun was setting shortly after we got settled in and the views, if it was at all possible, got even better. Goodness, if my place had sunsets like that, I’d be selling tickets for it! Lucky for the guests of Qasr al Sarab, this spectacular show of nature happens every single day. If you miss it or didn’t make the trek fast enough, come back tomorrow. She will be there same time (almost), same place. After sunset, it was time for dinner. 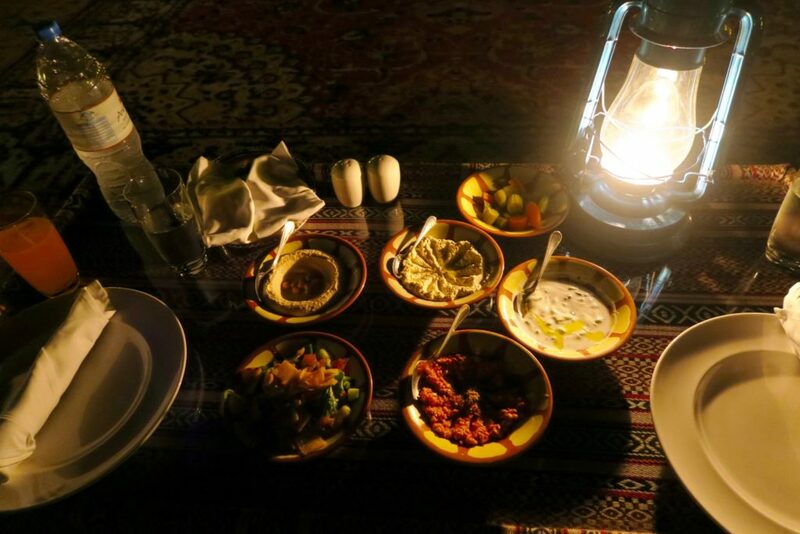 For our first night, we had an al fresco dinner at Al Falaj, an outdoor spread ala Bedouin camp. We had a Bedouin and Oriental cold mezzeh, a variety of grilled meats from the BBQ (lobster, fish, lamb and beef), fire roast potatoes, grilled vegetables and oriental rice. I loved the mezzeh platter and even had second servings of it. It was also quite an intimate setting as only guests of Qasr al Sarab are there (well, you can’t really expect any walk-ins!) And the atmosphere is very relaxed. 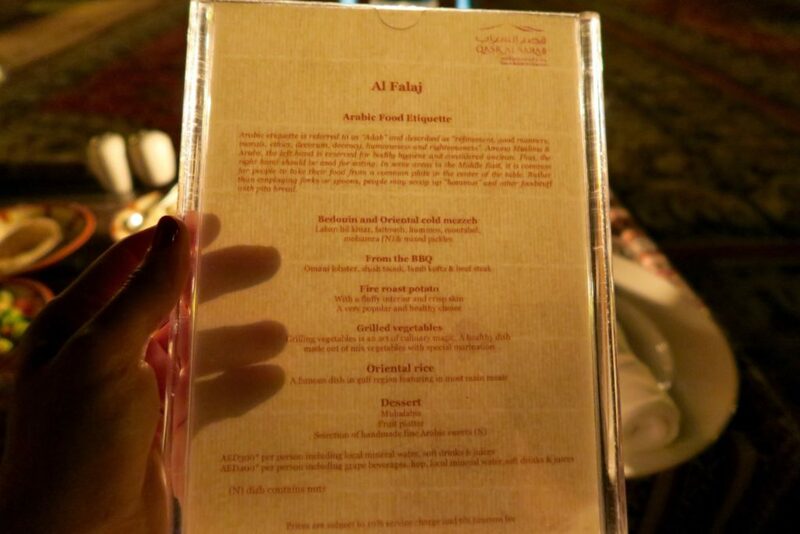 The dinner, at AED 300 per person for the meal with standard drinks of mineral water, soft drinks and juice, currently equates to about AUD 115.00 per person. Yes it’s not cheap but the entire experience does not feel cheap / touristy either. No flashy/ loud music or belly dancing, no big crowds. 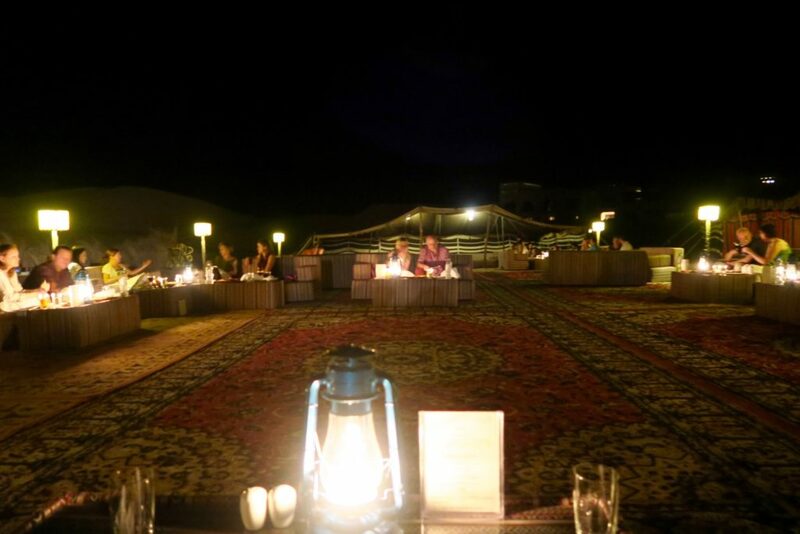 (If you have been to the standard dinner-in-the-desert packages in Abu Dhabi or Dubai that usually come with dune bashing tours, you’ll know what I mean). 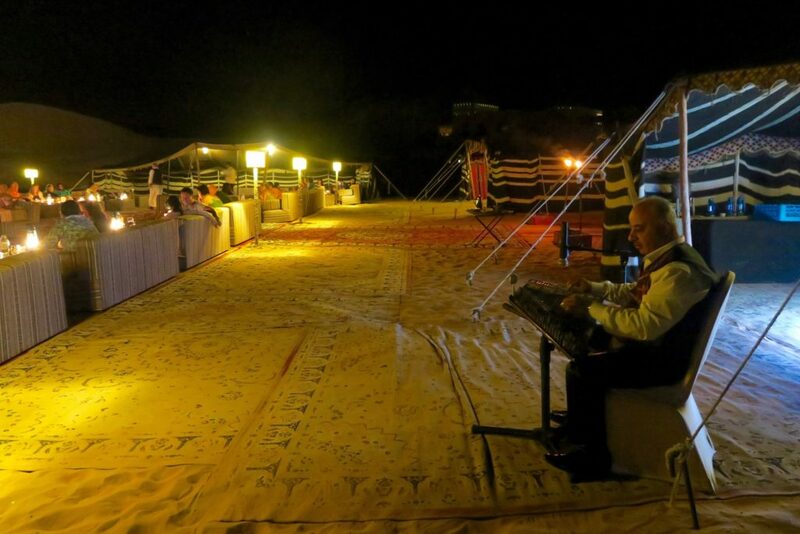 The music is performed live with a traditional Middle Eastern instrument and you can linger on as long as you like over tea and shisha, watching the greatest canvas of nature there is: the stars in the sky. 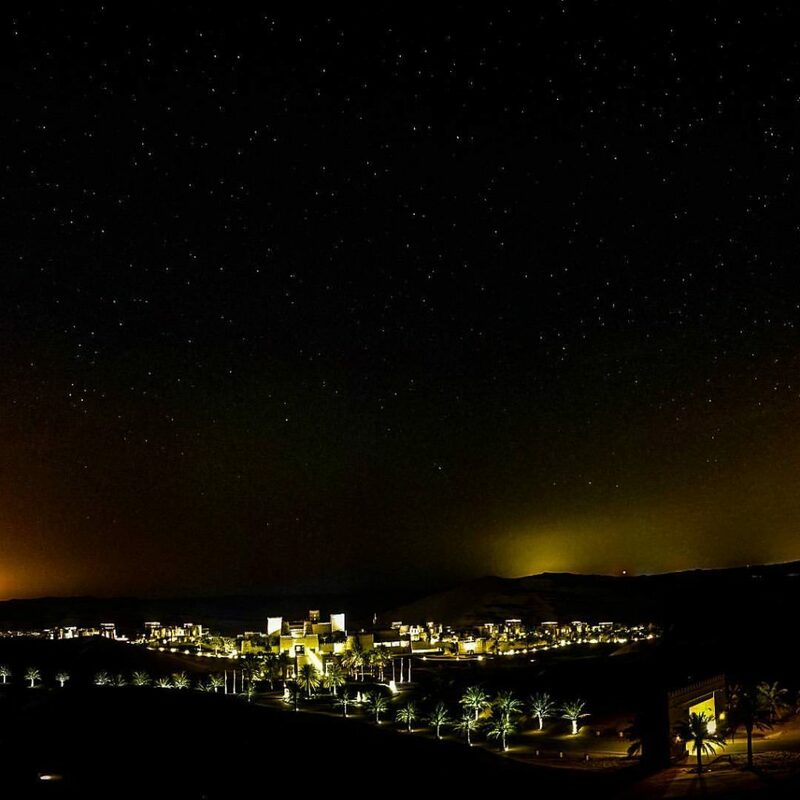 Speaking of stars, they do shine bright like diamonds in Liwa Desert. Stars shine the brightest amidst the blackest skies, and with nary a cloud in the desert, it was always a magical show of constellation. 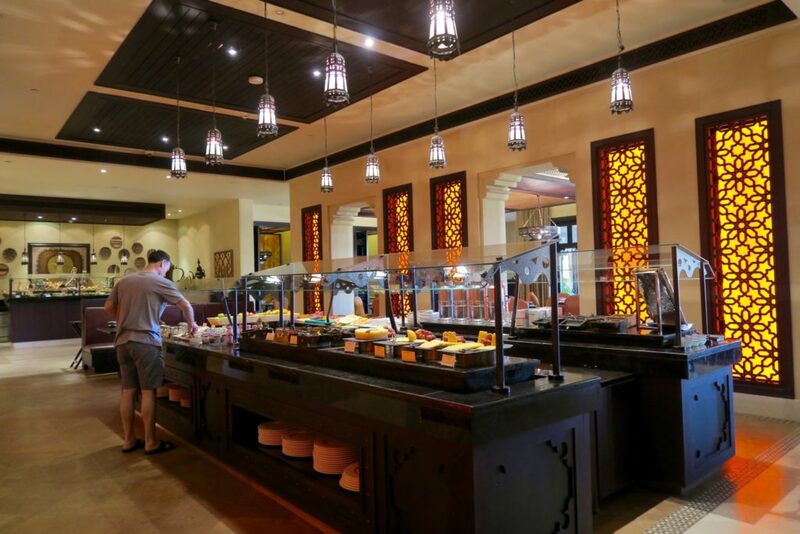 With dreams of skies full of stars, we had a leisurely sleep-in and had breakfast the next morning at Al Waha, Qasr al Sarab’s all-day dining offering live cooking stations of Middle Eastern, Oriental, and Western dishes. I normally have very light breakfast (if at all), but Al Waha has quite an impressive array of choices. Their noodle soups are fresh and amazing . If I didn’t have an appointment after breakfast, I would probably have gone for thirds, and more! Thank goodness for my date with the camels, my intention to pig out was culled. And this next part is what I absolutely loved about my stay in Qasr al Sarab. Their activities. Anantara, as a brand is quite big on providing their guests authentic local experiences. For instance, I was in Anantara Seminyak Bali last year and I had a private Balinese cooking lesson and a temple tour. 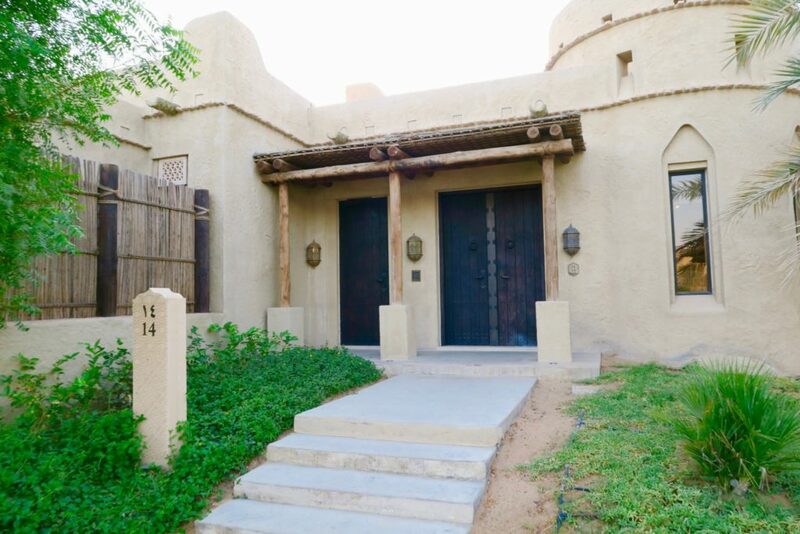 For Qasr al Sarab, there’s an array of activities you can do, all of which are created to present Emirati culture and hospitality. 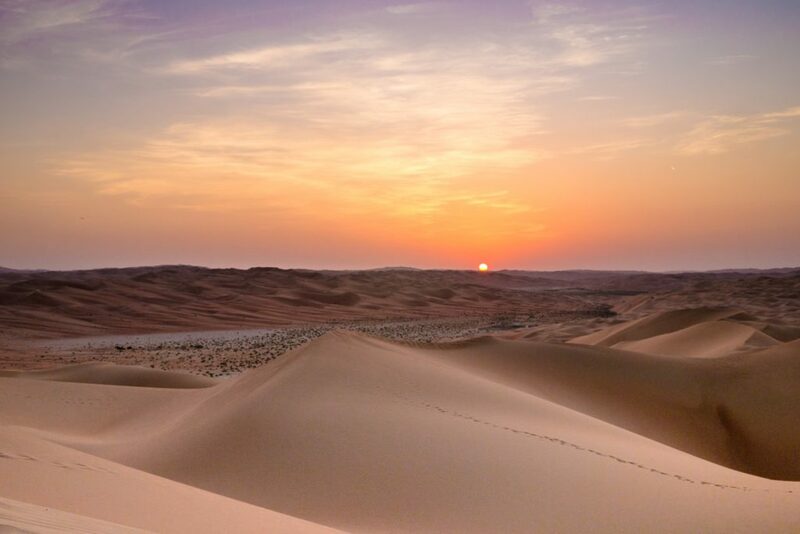 Just to name a few among an extensive list, there’s archery, desert walks, desert sailing, and dune bashing. 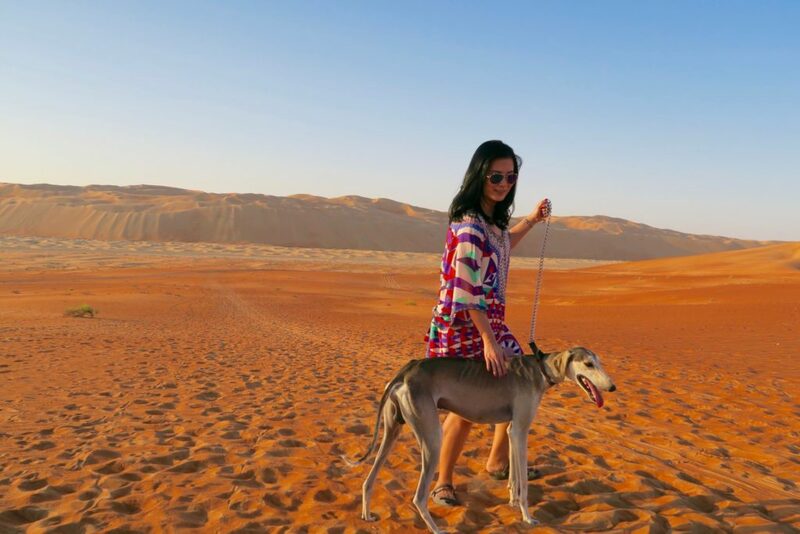 Being an animal lover, I chose camel trekking and the falcon and saluki show. For the camel trek, our guide Zain met us promptly at The Library, the meeting place in the resort for all activities. 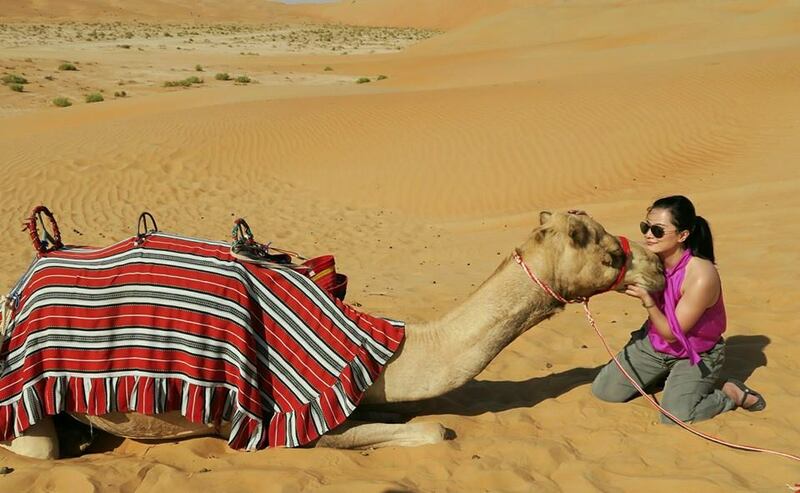 Because Anantara has their own desert and camels, this activity was done in a small group so it was quite intimate. I loved that the camels here are so relaxed and seem very happy. So different from the camels in the deserts close to Abu Dhabi and Dubai, camels who probably go around in circles all day carrying tourists. I’ve been to those twice and those camels, I tell you are not happy. They keep grumbling and pretty much have to be dragged or yanked to stand up. Zain, our guide, was also very good. He knows camels very well, and even taught me a little about ‘camel body language’ and so at the end of our ride, Zain told me that my camel was in a happy and receptive mood, and if I wanted to, we can remove his muzzle so I can interact with him. And this experience gave me a little bit of understanding of the importance of camels in the Middle East. Specifically, the relationship between Bedouins (and even modern day Arabs) and their camels. In harsh conditions, they depend on each other so trust is essential. After our camel trek experience, we went back to the hotel, had lunch and freshened up a bit. In the afternoon, we were ready for our second activity, the Saluki and Falcon show. The Saluki and Falcon are two animals used by the Bedouins to hunt thousands of years ago. The Saluki, one of the oldest dog breeds, was said to have travelled historically through the Middle East and Silk Route with nomadic tribes. This is the Saluki. And yes, I too, thought they were too thin. Petting them felt like running your hands through a xylophone. But the Salukis are not your usual fluffy, meaty dogs. That is the natural makeup of their bodies. Their bones are not made to carry much weight so if you try to fatten up a Saluki you are actually endangering them. They are hunting dogs, whose paws are padded. It was quite interesting to see such wide paws at the end of their skinny legs. These webbed or padded paws help get traction and speed when sprinting through sand. Watch my video above to see how fast these Salukis run! They also are what is known as ‘sight hounds’, meaning they set their eyes on their prey and use eyes to spot and hunt, more than their nose. 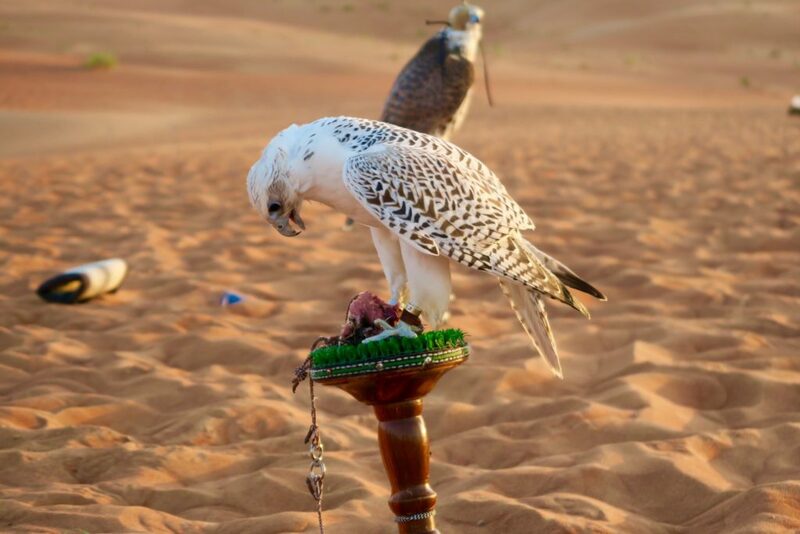 Now falconry, a popular sport in the Middle East, used to be a traditional hunting method used by Bedouins. 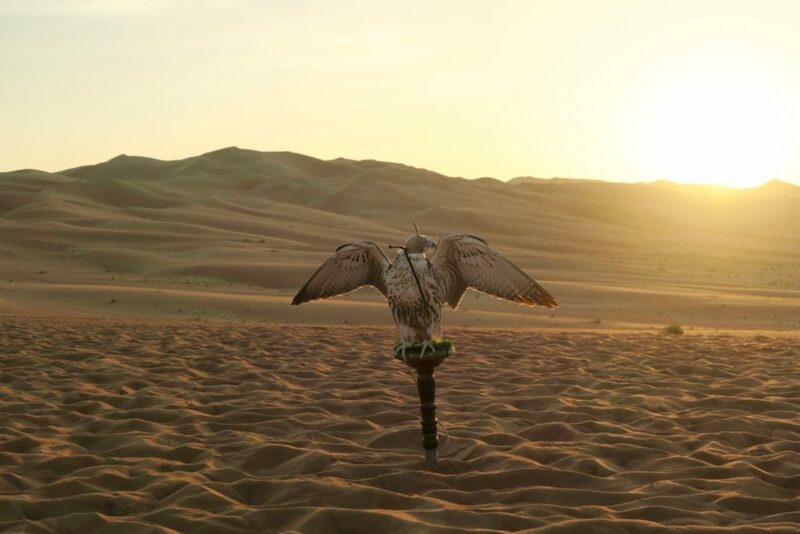 The falcons in the Middle East, such as the ones in Qasr al Sarab, are extremely fast, agile and can change their direction of flight mid-air quickly. They are carnivorous and solitary birds that only usually come together to mate. The falcon is the national bird of the UAE, and all falcons that are transported by flight have to have passports, and they must fly in business class too. That day was certainly one of the most memorable days I’ve had. 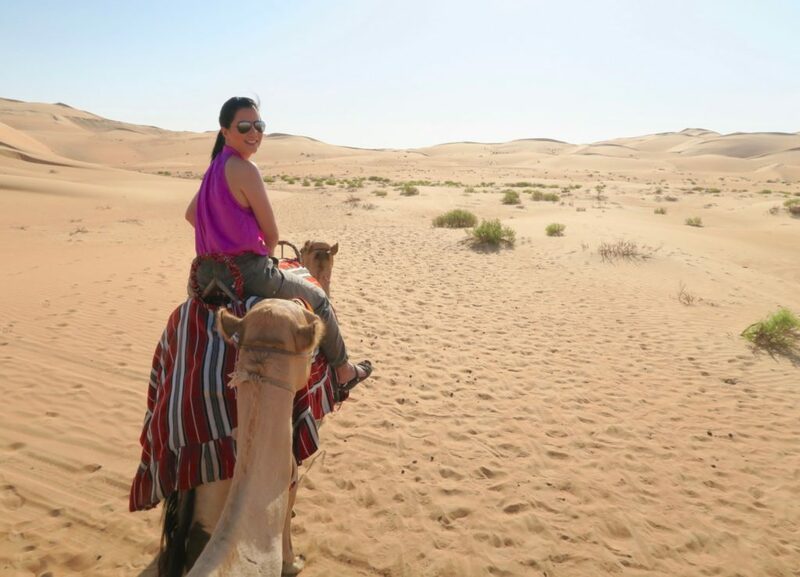 I learned so much about wildlife and culture in the UAE and in a very intimate and close environment too. All the animals were well cared for and it is easy to see it in their demeanor and physical appearance. After our day of adventuring with camels, salukis and falcons, it was time to head back to the resort and have our dinner. 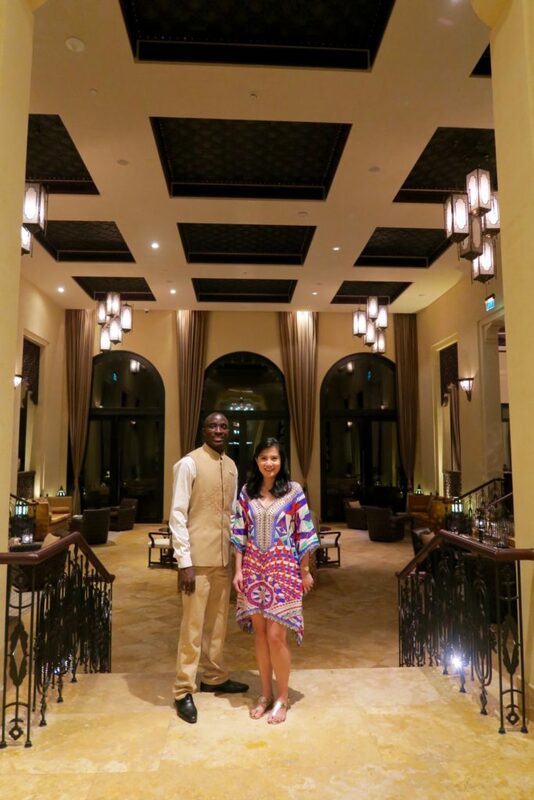 This time, we had dinner at Suhail, Qasr al Sarab’s upscale grill and rooftop restaurant. They specialise in steaks (and this includes grilled seafood and fillet steaks of fish). 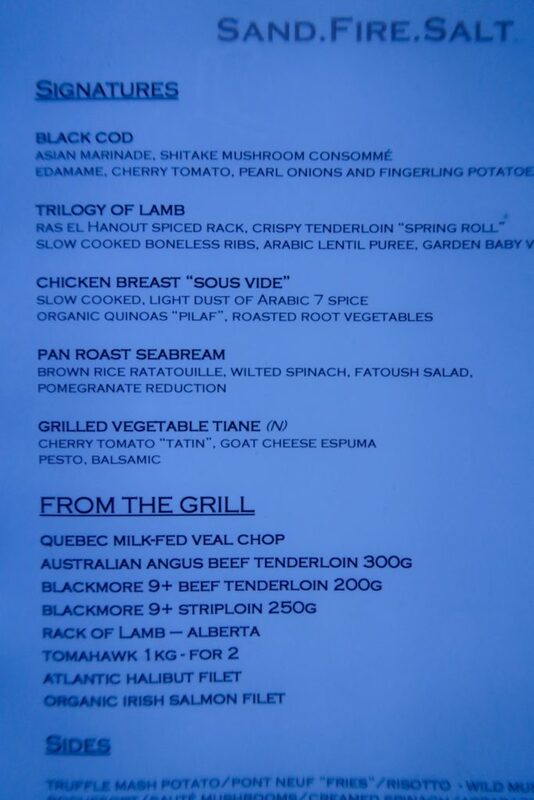 I loved the halibut, as it was grilled just right and the meat was fresh and succulent. 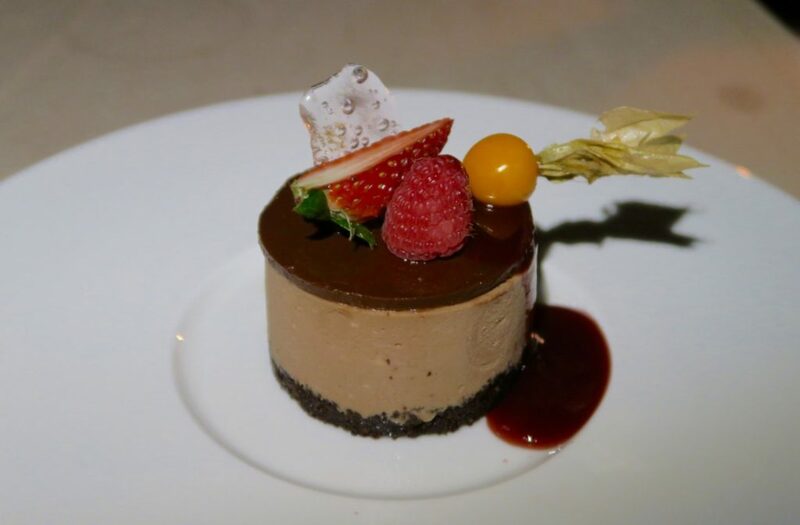 Their dessert of Chocolate and Nutella cheesecake was also sooo sinfully good! 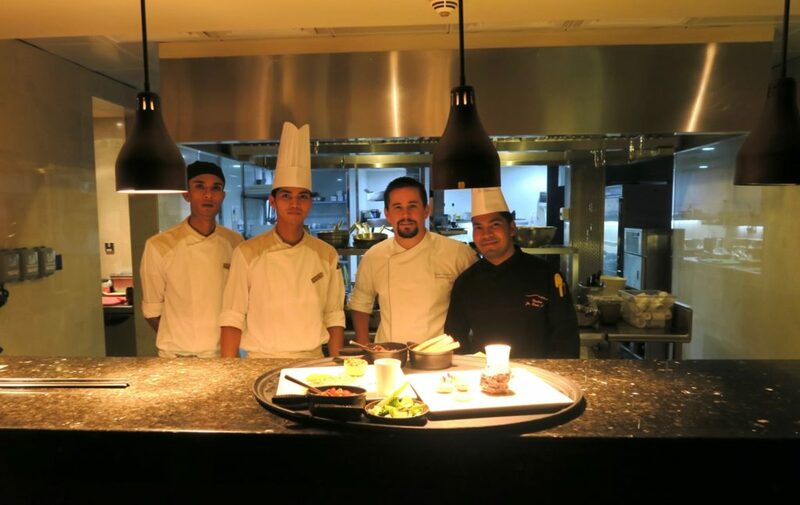 Suhail was an entirely different experience from our first night’s dinner and the variety is appreciated especially as there is really no option to go out and have your meal somewhere else. Variety and quality are important in a resort’s food and beverage when the location is as isolated as this. And I’m happy to say that Qasr al Sarab realises this and delivers quite well. 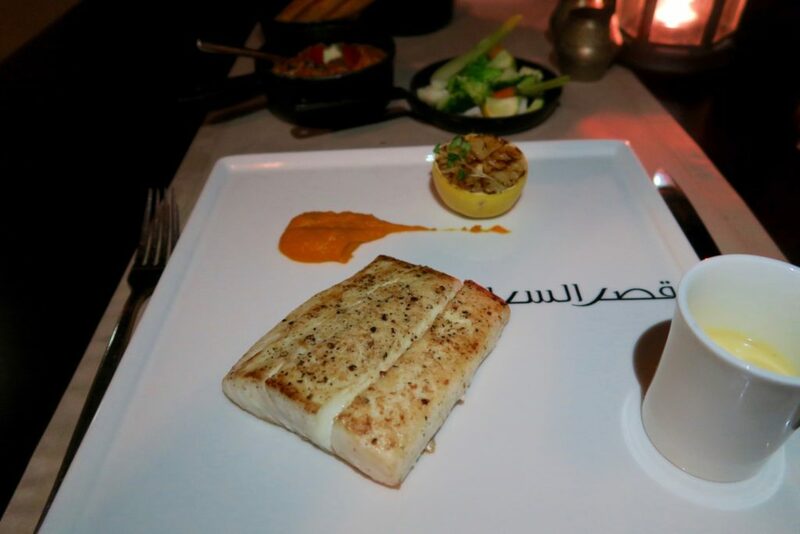 Food is undeniably expensive at Qasr al Sarab, as to be expected in such a place. One lunch we had by the poolside (sandwich / pasta kind) was around AUD 90.00, but as I mentioned previously – the quality of the food and the atmosphere are at the same level as their price. 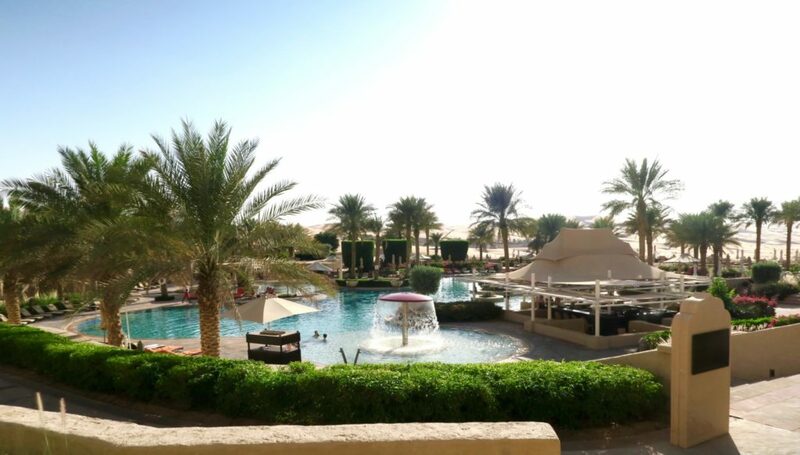 Speaking of poolside, Qasr al Sarab also has a pool available for all guests of the resort. And while the resort was almost full occupancy, the pool wasn’t crowded at all. Most likely because most guests are enjoying their pool villas. A stay in a luxury resort is similar to hearing a musical composition for the first time. All notes and elements must not only jive, but be polished and refined all on their own. 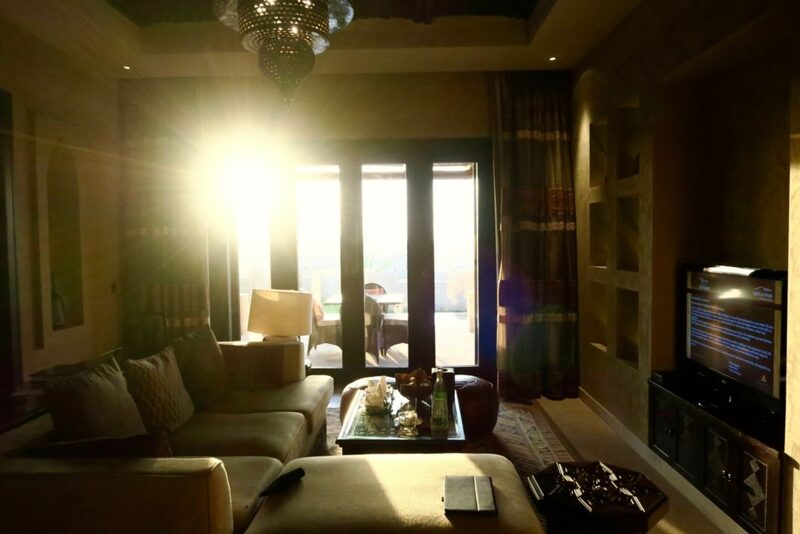 This is how I feel about my stay at Qasr al Sarab – it hit all the right notes. First of all, I was impressed with the customer service. Let’s start with Johannes, our private butler. Other resorts have the concept of a private butler too, but in certain cases they fall short in that a.) they are only ‘private butlers’ by name and you almost never see them again or b.) the personalities of the butler is either too stiff, or too zealous, bordering on intrusive. The soft-spoken and well-mannered Johannes was the perfect balance. He was engaging and in an interested way, not in a ‘i-have-to-do-this’ way. He was always curious about how our day went. He was on top of our schedules so that he was always the one to pick us up to and from our villa to the lobby, and also waiting for us at the gate when we would be back from our activity in the desert, and bring us back to our villa. He was also very concerned for our well-being, particularly that of Zombie’s – as Zombie loved to take photographs of the night sky and sunrise. This meant he was out until very late at night, and also needed to be up before 5AM to catch the sunrise. Zombie was just casually telling this to Johannes and then Johannes insisted that he himself also be up at those times to accompany Zombie. And at that, we absolutely refused. We said no, he needs to rest and Zombie can take care of himself. After a little more convincing that my husband really will be alright, Johannes then agreed but he said that the least he could do was arrange a wake up call at 4:45am so that Zombie won’t miss the sunrise. But it wasn’t just Johannes, really. I’d say 98 to 99% of the staff had the same polite and friendly demeanor to all guests. As an example, at breakfast buffet one morning, I already had a plate semi-full of chocolate croissants, and as I was walking back to the table, I spied the soup station. Of course, I had to stop and order a small bowl. I was already heading back, and my bowl wobbled just a tiiiiny little bit, and the staff (who was also the one making the soup), immediately dropped his ladle and said “Please, allow me to help you take this to your table.” His observation was amazing! And the proactiveness too. The General Manager of Qasr al Sarab, Mr Patrick Both, was himself very visible and spent a lot of time interacting with guests. So it is quite evident that a great manager emulates the kind of attitude that he wants his staff to adapt. 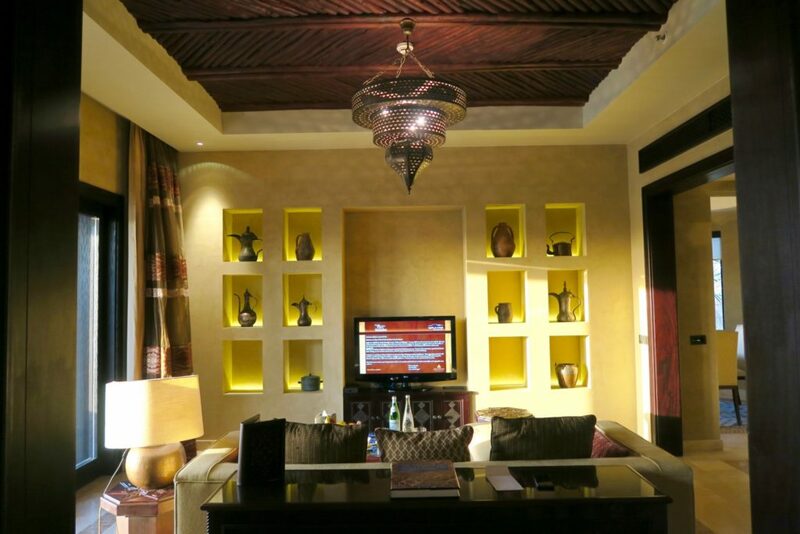 See, for a resort like Qasr al Sarab, it can be easy for them to rest on their laurels of having such a prime and luxurious location. I’ve seen this in a number of resorts, where their only edge is the location and the other factors fall short. 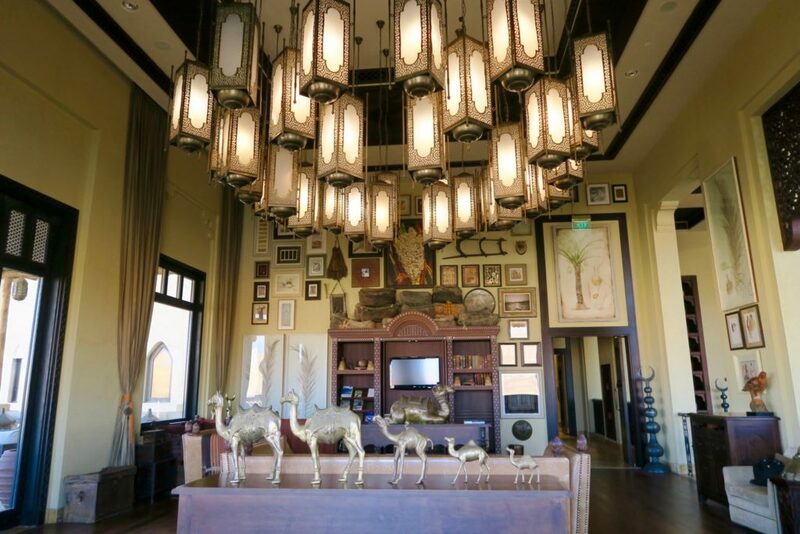 Yet what impressed me most is that Qasr Al Sarab has such a seamless experience , where both service and the actual product (surroundings) are stellar. I tried to look for signs of wear and tear in the resort (as upkeep in the desert must be a pain!) but the only signs of that were small and unobtrusive areas of renovation. 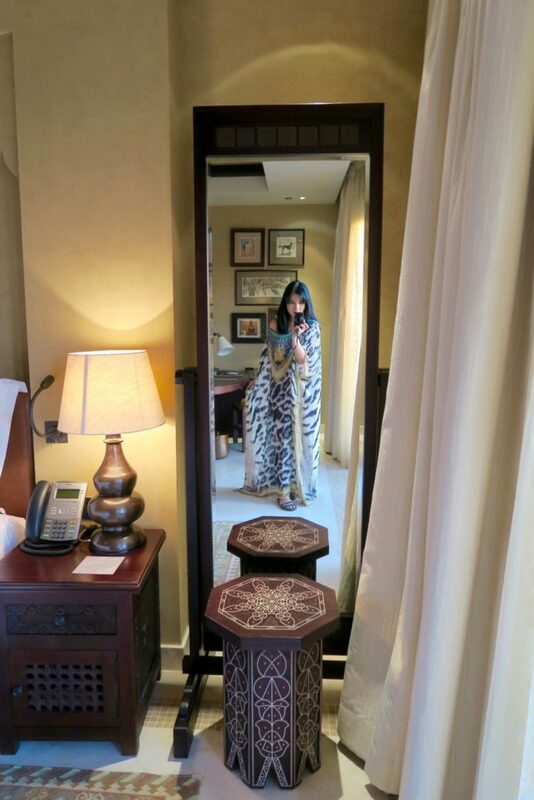 This I’ll say confidently – Qasr al Sarab is the best Anantara resort I’ve been to, and on the top 3 of best resorts in my list – including the water / ocean kind of resort. 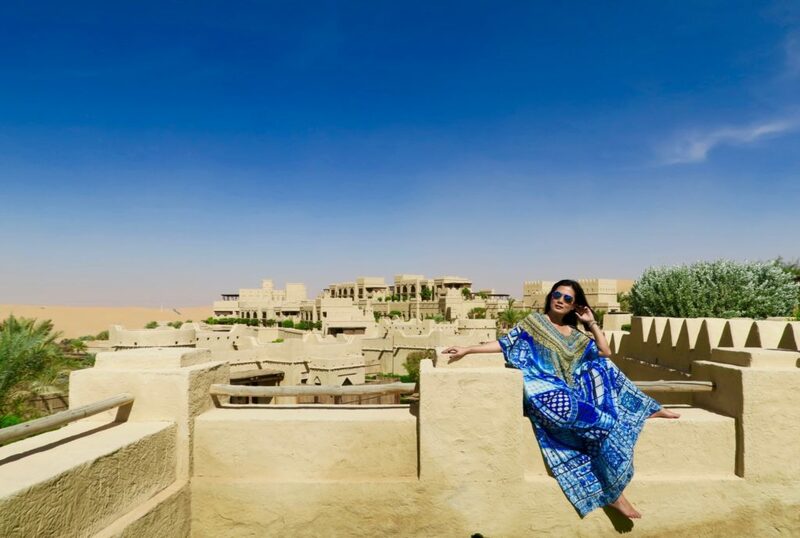 Qasr al Sarab Desert Resort by Anantara won the title of UAE’s Best Desert Resort for 2015 by World Travel Awards (dubbed by Wall Street Journal as the “Oscars” of the travel industry). I’ve been to quite a number of luxury resorts and while many are impressive, only a few really “get” my personal definition of luxury. 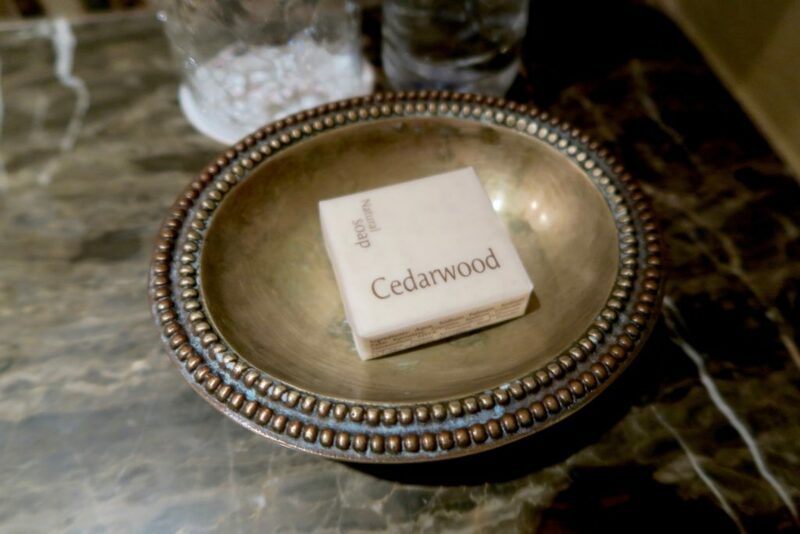 To me, luxury is more than just the thread count. It’s more than having a butler to speak of, it’s more than having a spacious room or boasting of a Michelin star rated restaurant in the hotel. It’s the overall experience that leaves a lasting note. It’s the human touch in an intricate combination of hospitality factors of which there is no proper ‘formula’. And I’m so glad that I found a resort that wholly grasps and brings to fruition this belief. Have you been to a desert resort or a non-ocean kind of resort? What defines your idea of a perfect luxury resort / hotel experience? Rates at a One Bedroom Villa with Private Pool begins at roughly AUD 1,350 per room, per night, on an advanced purchase rate. all views and opinions are mine. Ah Jean, it’s a mini-vacation to just read this review. I’ve heard of this this resort but haven’t been there… and wouldn’t take the kids!! It sounds divine. You have been to many places so reading your high prause does make an impact. It’s so good to read your very detailed review, by the way, in an era where there are too many “Top 10… this and that” posts which are so insubstantial. I love travelling in the MIddle East! They really redefine hospitality. Actually now that you mention it, the hotels that I’ve stayed in in the Middle East are really quiet. It’s a really nice change! Hi Lorraine, yes all hotels in the Middle East take things to a much higher level! Even their Ibis / Holiday Inns seem like luxury compared to their counterparts here! What a beautiful place – apart from a stopover in Dubai, I’ve never been to the Middle East, but it’s definitely on my list (especially after reading this)! What an impressive scenery, it’s magical! And I really like the villa! Anantara is definitely a well growing luxury group in hospitality. Hi Francois, I agree Anantara has really grown. And this one is their prime property, I have to say!